When I was a teenager I’d have these bouts of moodiness and fits of anger for no apparent reason. No one knew what was wrong with me, including me. I just thought I was some kind a-hole or a mini-me of Damien from the movie The Omen, I swear to God I have no idea how my parents tolerated me. When I was in my twenties I discovered a new creature that would torture me for years…energy vampires. They always found their way into my life, I had no idea why I was always attracting these kind people. I knew something was seriously wrong because after long phone conversations with them, or being around them for long periods of time I felt weak, energy drained, and sometimes I would develop tension migraines. Periodically I’d walk into a place or a room and feel a force, an explainable current of energy, and I would feel like I would leave with that energy like it was following me. The one issue that really annoyed me was I couldn’t keep money in my pocket, every time I would come across large sums of money something would happen so I would lose it as fast as I gained it. I found out the hard way that I was an empath. Unlike other people, empaths pick up good or bad energy from places or people effortlessly. Energy vampires also love empaths, it’s like virgin blood to them. An empath can effortlessly feel what other people feel. If someone is near an empath and they’re extremely depressed, an empath can pick up their energy and start feeling depressed too, even though a minute ago they were in a perfectly good mood. This explained why when I was younger I would act out all these negative emotions, although I had no reason to be negative. Eventually, I was led to study the spirit world and I learned how all things in nature have physical as well as spiritual properties. Crystals and stones really piqued my interest so I delved deeper into how they affect our body and mind. The author that I value the most is Katrina Raphaell , not only is she a pioneer in the crystal healing movement, but her Crystal trilogy of books Crystal Enlightenment, Crystal Healing and the Crystalline Transmission were priceless in my crystal healing education. Contrary to what mainstream western religions have indoctrinated into us about the color black, it’s not something of evil, in fact, no color is good nor evil, they all possess different frequencies and properties. Black crystals and stones such as black tourmaline, black obsidian, black onyx and shungite are some of the most powerful protectors in nature from negative energy and entities. When choosing crystals or stones for protection you don’t just want to deflect and transmute negative energy, you also want to strengthen your aura with high vibratory light from stones such as labradorite, blue kyanite, and amethyst etc. What makes a bead a superior form of the crystal or stone is its spherical shape. The healing energy of a crystal or stone in the shape of a sphere circulates in the same pattern as the Earths magnetic field. When crystal beads are lined beside one another, instead of circulating individual energy fields they become one big field of circulating energy. When the beads touch your skin, the radiated energy of the beads merges with the human aura and also becomes one. I Initially applied these principles in designing protection and healing bracelets for myself, thankfully because of the crystal bracelets I no longer was victim to energy vampires or any form of negative energy. Now I create them for everyone else to benefit from their healing and protective properties. 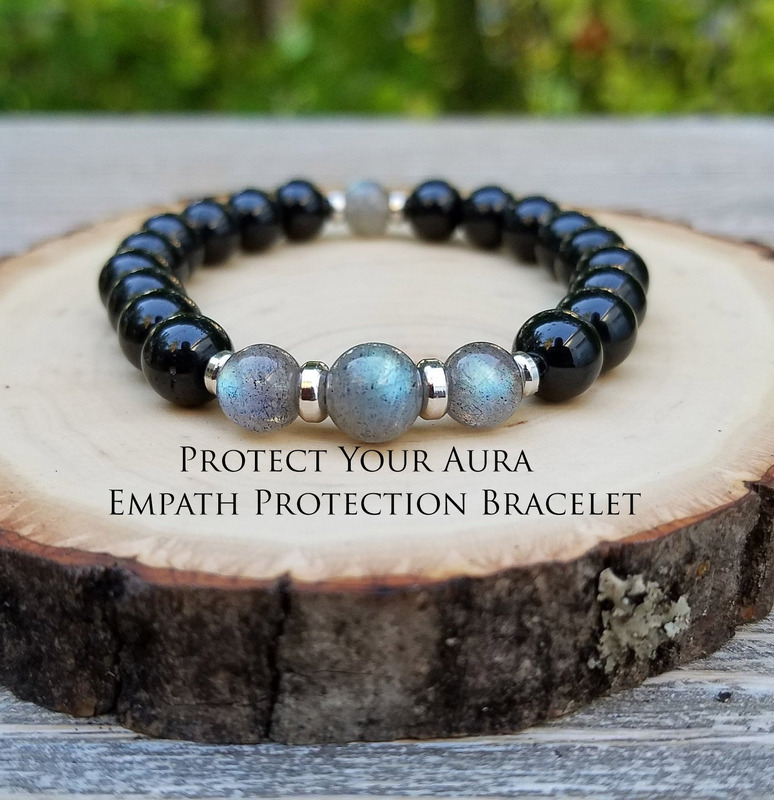 If you’re an empath or need protection from negative energy, energy vampires or dark magic you can find many powerful protection bracelets I have created on Etsy.com by clicking here.